I drank too much in the red tent last night. It wasn’t really my fault. There wasn’t anything else to do. We met up with our friends…waited for the rain to stop…and it didn’t for more than a few minutes at a time, so we stayed. I woke late and since it was raining again, stayed in bed. Thank god for the tent and the bed. Eventually I roused myself and went to the showers since I absolutely stank. They weren’t bad. A trailer with four white plastic cubes inside and a partition that didn’t quite protect clothes from getting wet. 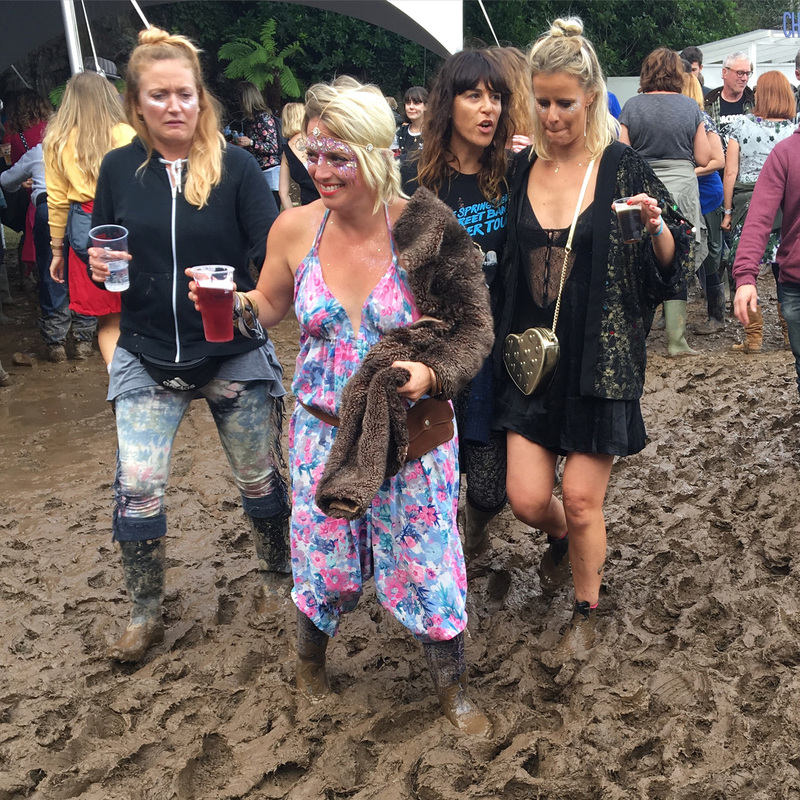 However–the 100 feet from our tent to the bathrooms was nothing but mud and puddles. Deep mud. Scary, shoe-sucking mud (there were actual shoes in it). The grass, which covered the ground when we arrived, had been decimated, remaining only in the spaces between the tents protected by the tent poles and ropes. 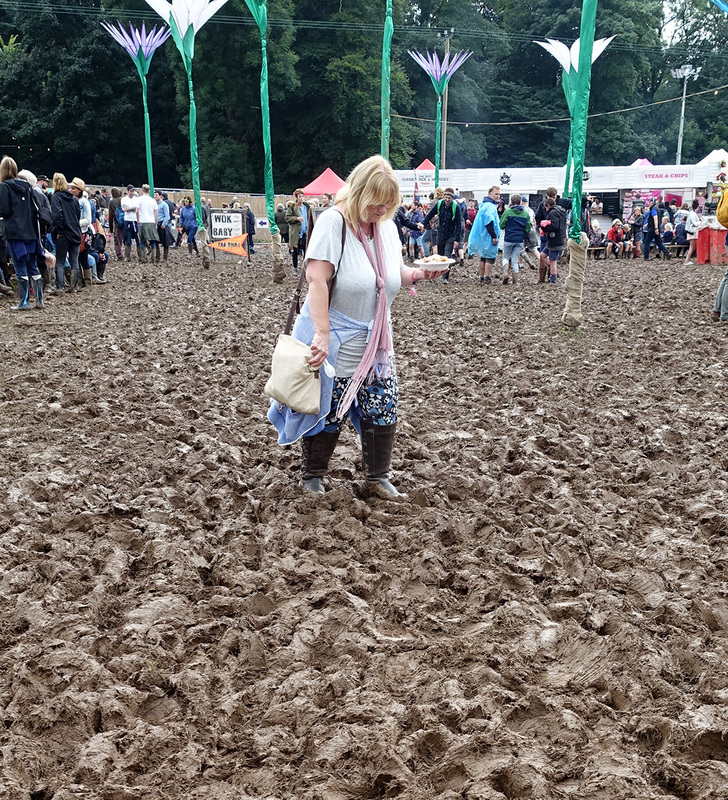 We walked through the main arena area and it was awful. Ankle deep mud and slippery (though the band played on). We made it to the village and found D. and J. in the wifi area (you can on get it if you are no more than 20 feet from the point). Even they looked discouraged which was a bad sign. They are two of the most optimistic, make-do people I know. D. wanted a shower and J. wanted a nap. R. and I walked down to the water and got grilled cheese sandwiches and a pint. The people watching was good but my heart wasn’t in it. It was a slog just to get there. Even the paved road in the village to the waterfront was slippery. I wanted to take another walk in the beautiful woods but J. told me they, too, were pure mud. I admired the people who managed to drink and dance and yell woo in these conditions. Apparently many English festivals are like this. I just couldn’t. I like rain but all the mud made me sad. We made our way back to the tent, stopping to watch an organized dance in the town plaza. We got a text from our friends when we stopped at the wifi point saying they’d be at the beer tent at 8pm, but I was safe and warm in bed by then. 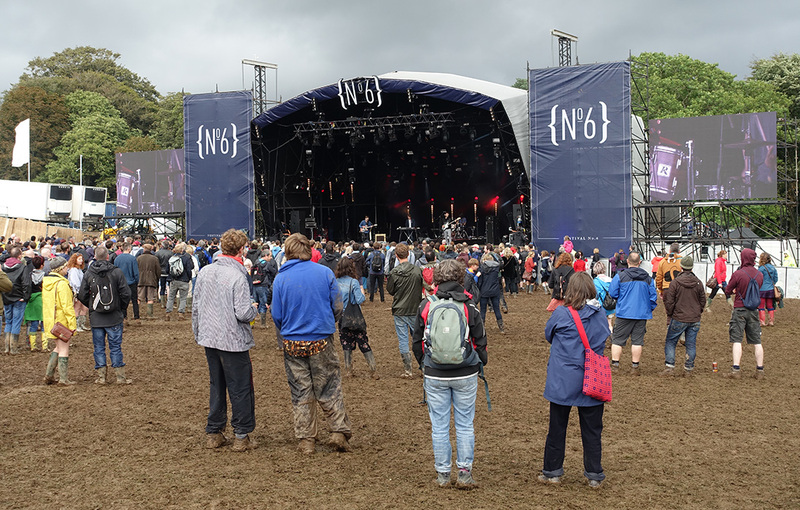 We heard later that the “gin” tent near us collapsed from the weight of water on the roof and people had to crawl out, so the leak in our floor didn’t seem quite so bad. This entry was posted on September 4, 2016 by roadtripz. It was filed under 2016 travel, Europe .